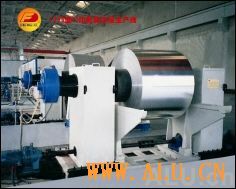 1350 type PS printing plate coating line can conduct continuous pre-treatment to PS aluminium coil base of drying, coating, solidity, transection and piling. The facility boasts compact structure and the PLC system control, can meet the quality, quantity, specification and type of printing plate thicked 0.15mm-0.30mm. The facility is featured smooth operation of complete appliance, compact graining of plate surface, well-proportioned coating, controlled film thickness, hairside treatment, quick plate burning.